In the featured video below, Grounded, (in which I actually appear) you’ll see how poking holes in the soles of your shoes and inserting a grounding rod can allow you to stay grounded, as can special grounding shoes that are now available (sporadically). Leather-soled shoes will also allow you to stay grounded with the Earth. 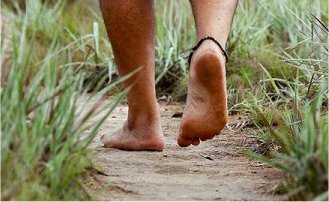 Walking barefoot is one of the easiest and best ways to stay grounded, but you’ll need to do so on the proper surface.